Following on our recent release of Fliq Tasks, we have a similar large update now for Fliq Notes! You'll see we're bumping to version 3, and the increase in version number reflects a big shift in the product -- in addition to the way Fliq Notes has always worked on your mobile device, we have added support for cloud sync across multiple devices and cloud backup via our new Fliq subscription accounts. 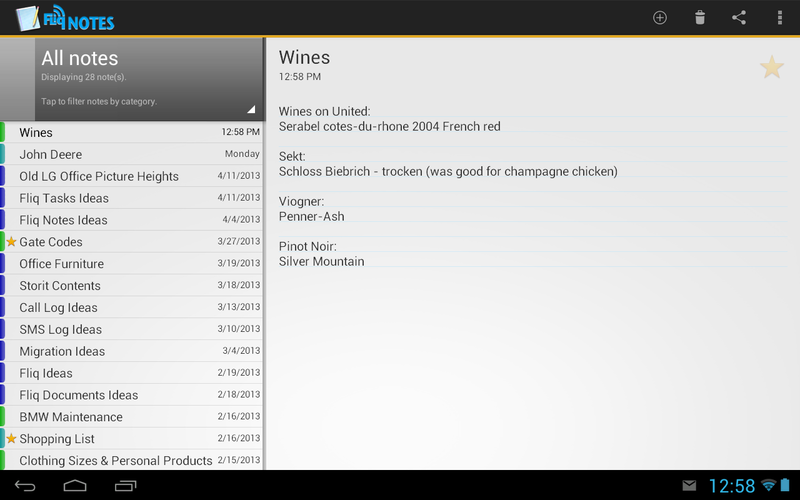 Updated UI for Fliq Notes. This is the Light theme. There is also a Dark theme. Updated behavior of back button on tablets. If a note is being displayed, back will clear the note. Hitting back when no note is selected will exit the application. Widget is now smarter about showing a category without any notes -- rather than be blank, it will tell you that the selected category has no notes. Menu items related to The Missing Sync have been removed, although we do still support sync with Mac/PC desktop via our Missing Sync product. As it has been, the application remains free to use on your devices. What is new to the table are our subscription accounts, which add the ability for you to keep a secure backup in the cloud, as well as to keep your notes in sync between as many devices as you like via our new Fliq premium accounts. Mix and match between phone, tablet, etc. We're starting with Android and we are in the process of submitting to the various stores for Nook, Kindle, BlackBerry 10 and BlackBerry PlayBook. You can sign up for an account at fliq.markspace.com, and purchase a 1-year subscription for $9.99 direct from our online store. Fliq Notes 3.0 is available now in Google Play. It will appear shortly in the Nook AppStore, Amazon AppStore, and BlackBerry World (for PlayBook and new BlackBerry 10 devices).